Between 1939 and 1945, the British public was spellbound by the martial endeavours and dashing style of the young men of the RAF, especially those with silvery fabric wings sewn above the breast pocket of their glamorous slate-blue uniform. 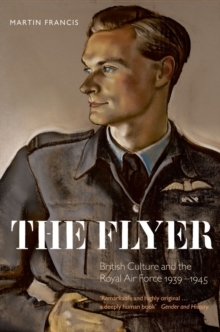 Martin Francis provides the first scholarly study of the place of 'the flyer' in British culture during the Second World War. Examining the lives of RAF personnel, and their popular representation in literary and cinematic texts,he illuminates broader issues of gender, social class, national and racial identities, emotional life, and the creation of a national myth in twentieth-century Britain. In particular, Francis argues that the flyer's relationship to fear, aggression, loss of his comrades, bodily dismemberment, andpsychological breakdown reveals broader ambiguities surrounding the dominant understandings of masculinity in the middle decades of the century. Despite his star appeal, cultural representations of the flyer encompassed both the gentle, chivalrous warrior and the uncompromising agent of destruction. Paying particular attention to the romantic universe of wartime aircrew, Francis reveals the extraordinary contrasts of their daily lives: dicing with death in the sky one moment, before sitting down to lunch with wives and children in the next. Male and female experiences during the war were not polarized and antithetical, but werecomplementary and interrelated, a conclusion which has implications for the history of gender in modern Britain that reach well beyond either the specialized military culture of the wartime RAF or the chronological parameters of the Second World War.